Royal Dutch Shell Plc’s London headquarters suffered thousands of dollars’ worth of damage after climate-change protesters smashed doors and glued their hands to windows. A group called Extinction Rebellion targeted the Anglo-Dutch oil major as part of a days-long event in which it disrupted public areas throughout London with banners and props. The actions were designed to draw attention to the use and production of fossil fuels. The culpable protesters expect to face a jury trial where they hope to further broadcast the group’s goals, the organization said in a statement. 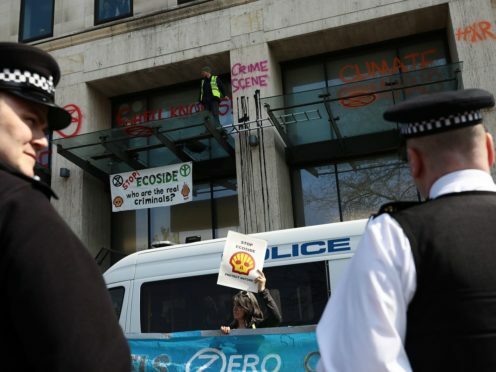 One activist has already been arrested for the actions at the Shell office, out of nine that participated, Extinction Rebellion said. “We respect the right of everyone to express their point of view, we only ask that they do so with their safety and the safety of others in mind,” a Shell spokeswoman said by email. Earlier this year, members of the same group glued their hands to the doors of the InterContinental Hotel at International Petroleum Week in London. It took police several hours to remove them.